Beth Marshall has a sweet soulfull sound and the combination of her rich voice and haunting melodies and lyrics will have you anxiously nailbitingly awaiting her next release! Beth is one of those rare gifted musicians/songwriters who found expression for her heart through music. At age 13 she was a reclusive, shy, frustrated illustrator who found that she could not express all that she felt on a canvas. Frustrated, she prayed for an answer. That night a song came to her. She picked up her sisters flea market guitar, and in 10 minutes was playing the song. She swapped five Barbie dolls for the guitar, and has never looked back. In high school Beth took visual performing arts and received voice lessons and opera training. The shy Beth found people liked her voice and music and she found acceptance on stage. Beth now enjoys playing in local coffe shops and clubs. She has a fan base that ranges from the young to the old. 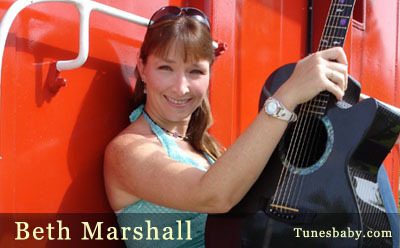 Her folk blues style appeals to all age groups, and is famlly rated. Take her for a spin, but be sure and stay tuned as this up and coming songwriter gains deserved recognition.